The Mysterious Gunshot Death of Margaret Routledge. 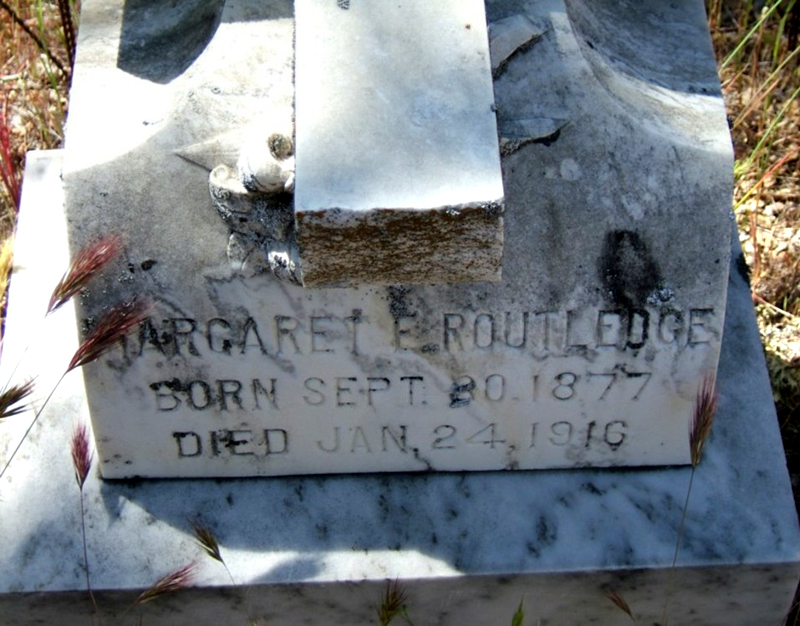 The mysterious death of Margaret Routledge in 1916 was the focus of a March 2014 episode of the Travel Channel's "Ghost Adventures" series (read story), where documentary filmmakers Zak Bagans, Nick Groff and Aaron Goodwin conduct paranormal investigations of old buildings. 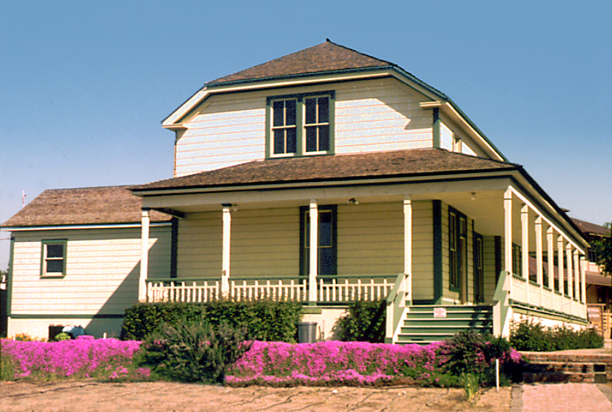 In their "Heritage Junction" episode, the cast members connect Routledge's unsolved death — by gunshot wound to the chest, supposedly while lying in her bed — to the spooky noises they capture on tape, coming from the upstairs living quarters of the Newhall Ranch House at Heritage Junction Historic Park in Newhall. Who was Margaret Routledge in real life? From the marriage license, death certificate and newspaper article below (courtesy of SCV historians Pat Saletore and Lauren Parker), we know she was the wife of Stanley Routledge, who in 1916 was the ranch manager of The Newhall Land and Farming Co.'s Santa Clarita Valley property. They lived in the Newhall Ranch House — the company's local operations building — located, at the time, at Castaic Junction (then considered Saugus) near the Southern Pacific Railroad's Saugus-Ventura spur line. It doubled as a telephone and telegraph office. The house — probably erected as a smaller structure in the 1860s by landowner Thomas R. Bard (as agent for his uncle Thomas A. Scott) and expanded to its current form by Henry Mayo Newhall's son Gregory in the 1890s — sat just north of the present-day Magic Mountain amusement park. The structure was moved to Heritage Junction for preservation in August 1990. Margaret Routledge, nee Margaret E. Smith, hailed from Jolon in Monterey County. 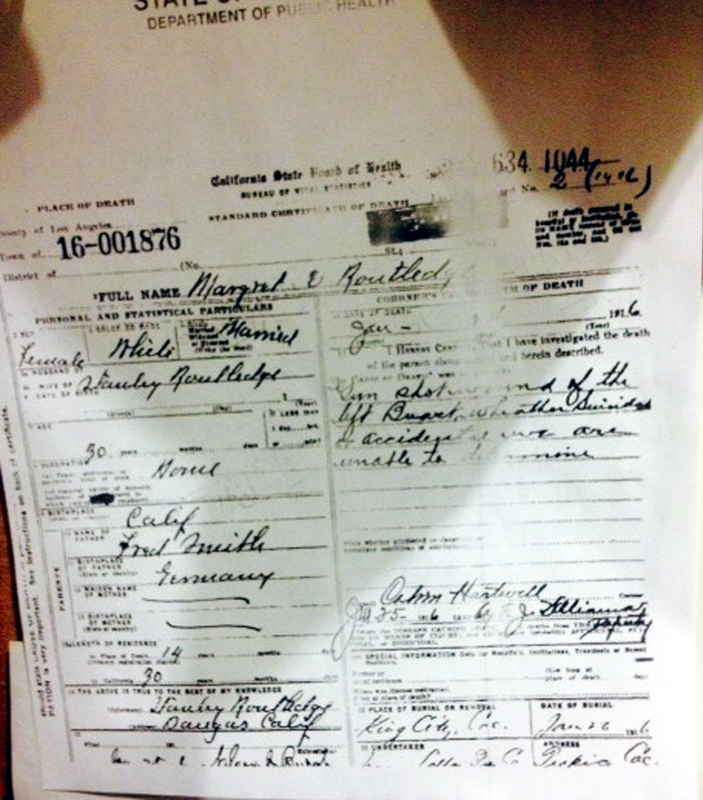 Margaret was born in California on Sept. 30, 1877; her father, Fred Smith, was born in Germany. 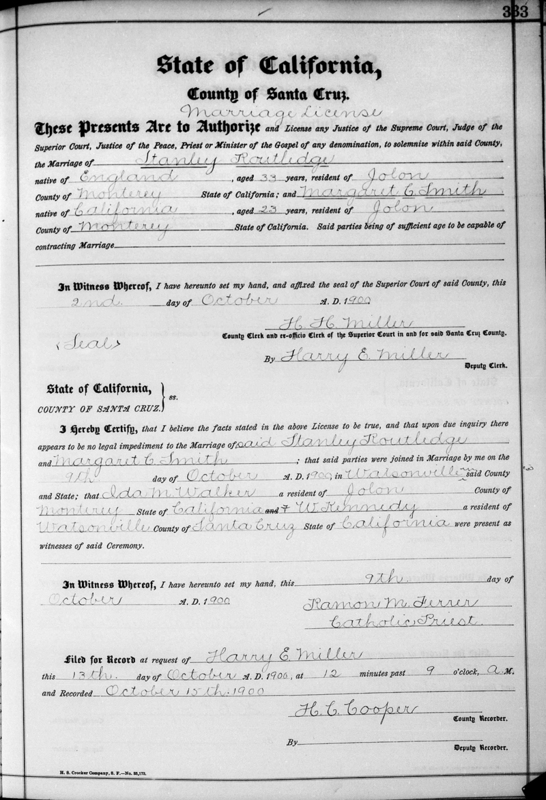 Margaret was 23 years old when on Oct. 9, 1900, she married 33-year-old Stanley, who had emigrated from England. Margaret died Jan. 24, 1916, age 38 years. Her cause of death was listed as a gunshot wound to the left breast. According to the news story below, the weapon was a rifle and she met her demise inside her ranch home. She is buried in her hometown of Jolon. Mystery. Shot To Death; Way Unknown. Wife of Land Company Manager is Slain on Ranch. Suicide, Accident or Murder? Authorities at Loss. Remarkable Lack of Evidence to Support Any Theory. With a rifle bullet through her heart, the body of Mrs. Samuel Rutledge [sic: s/b Stanley Routledge], wife of the manager of the Newhall Land and Water Company [sic] was found Monday evening in her house on the Newhall ranch, three miles from Saugus. After a close investigation, Coroner Hartwell was unable to lift the veil of mystery surrounding the woman's death, and it is not known whether she ended her own life, was accidentally shot, or was the victim of an assassin. There is a remarkable absence of evidence of any kind in the peculiar case, according to the officers who investigated. That the woman was murdered is not likely, according to her friends. The Coroner's verdict says that Mrs. Rutledge came to her death by a gunshot wound in the heart, but that from the evidence at hand it is impossible to determine the manner of the shooting. Mrs. Rutledge was, according to reports made to the Coroner, perfectly happy in her home life. When her husband left her Monday morning she was still in bed, eating her breakfast, a habit that she indulged in . that was the last time she was ever seen alive. In the afternoon a servant discovered the dead body in the room. The rifle was near by. Dr. Stone of San Fernando was called and he arrived and at once pronounced the woman dead and notified the Coroner. The absence of a note or other message, and the fact that the woman led a beautiful Christian life, placid and without worry, was in good health and was not despondent, would indicate that her death was not self-sought. She never handled a rifle and did not know how to use it. There were servants near by, but they knew nothing of the tragedy until the body was found. The body of the slain woman was removed to the mortuary of Scovern, Litton & Frey at Tropico, from where the funeral will be held today. Mr. Rutledge, the husband, has been the manager of the Newhall Land and Water Company for more than thirteen years, and is one of the best-known business men in Newhall and Saugus. There are no children. These presents are to authorize and license any Justice of the Supreme Court, Judge of the Superior Court, Justice of the Peace, Priest or Minister of the Gospel of any denomination, to solemnize within said county, the marriage of Stanley Routledge, native of England, aged 33 years, resident of Jolon, County of Monterey, State of California; and Margaret E. Smith, native of California, aged 23 years, resident of Jolon, County of Monterey, State of California. Said parties being of sufficient age to be capable of contracting marriage. In witness thereof, I have hereunto set my hand, and affixed the seal of the Superior Court of said county, this 2nd day of October, A.D. 1900. County clerk and ex-officio clerk of the Superior Court in and for said Santa Cruz County. By Harry E. Miller, Deputy Clerk. I hereby certify, that I believe the facts stated in the above license to be true, and that upon due inquiry there appears to be no legal impediment to the marriage of said Stanley Routledge and Margaret E. Smith; that said parties were joined in marriage by me on the 9th day of October, A.D. 1900, in Watsonville in said county and state; that Ida M. Walker, a resident of Jolon, county of Monterey, state of California, (and) W. Kennedy, a resident of Watsonville, county of Santa Cruz, state of California, were present as witnesses of said ceremony. In witness thereof, I have hereunto set my hand, this 9th day of October, A.d. 1900. Filed for record at request of Harry E. Miller this 13th day of October, A.D. 1900, at 12 minutes past 9 o'clock, a.m., and recorded October 15th, 1900. I hereby certify that I have investigated the death of the person [illegible] herein described. Gun shot wound of the left Breast, whether suicide or accidental we are unable to determine. 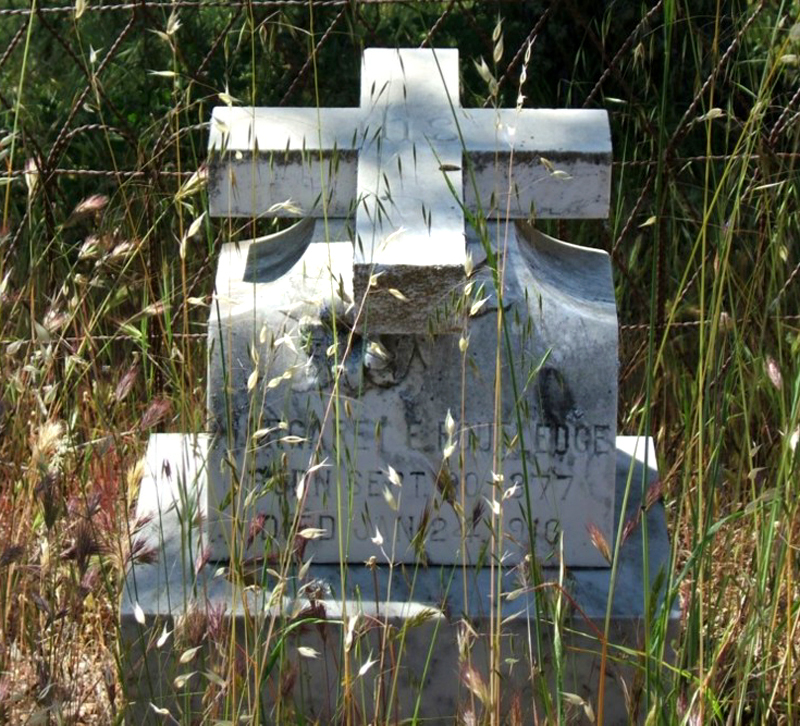 Place of burial or [illegible]: King City, Cal.